Seven years after Republicans began campaigning on repealing former President Obama's 2010 health care law, all efforts to revamp it appeared to end Tuesday. The two Texas senators had a lot of political capital invested in it. 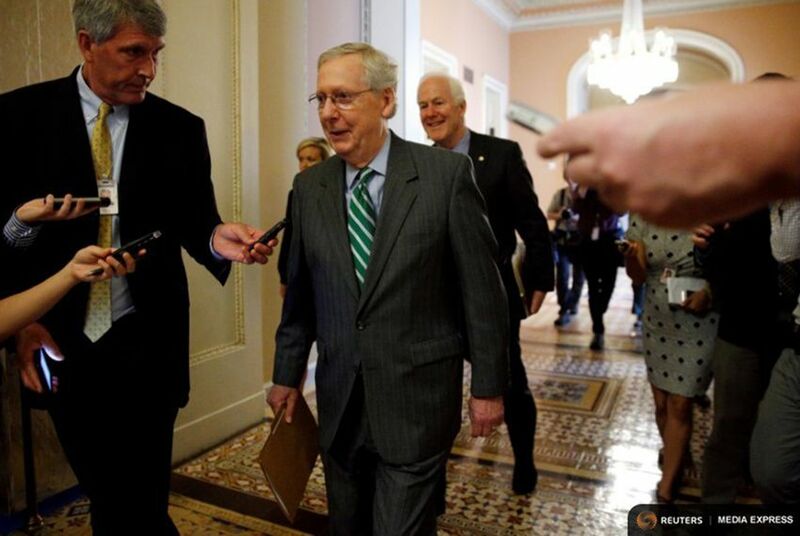 WASHINGTON – It took less than 24 hours for the defection of two Senate Republicans to bring about the complete collapse of their party's health care overhaul efforts. The unraveling began Monday evening with the announcements from U.S. Sens. Mike Lee, R-Utah, and Jerry Moran, R-Kansas, that they would oppose the current version of a bill overhauling former President Obama's 2010 health care law. That put U.S. Senate Majority Leader Mitch McConnell two votes short of the minimum 50 votes he needed from his 52-member caucus. "It was disappointing," U.S. Senate Majority Whip John Cornyn of Texas said Tuesday. There has been no other issue more central to GOP advertising, organizing, enthusiasm and fundraising over the last seven years than repealing Obamacare. But unless congressional Republicans can muster a miracle, the current health care debate appears to be over. McConnell pledged on Monday evening to proceed with repeal legislation that did not include replacement mechanisms. Like his previous repeal-and-replace bill, he could only afford to lose two GOP senators for the straight repeal effort. He promptly lost three: U.S. Sens. Shelley Moore Capito of West Virginia, Susan Collins of Maine and Lisa Murkowski of Alaska. "This has been a very, very challenging experience for all of us," McConnell told reporters on Tuesday afternoon. He is expected to move forward with the repeal legislation, if only to put his fellow Republicans on the record following four election cycles in which hundreds of GOP Senate and House candidates ran on repealing the law. The two Texas senators had much political capital invested in a GOP-led health care overhaul. Cornyn, the party whip, emerged as a chief salesman of the concept in recent weeks, a prominent defender of leadership's efforts on social media and on television. U.S. Sen. Ted Cruz was intimately involved in negotiations too, and prided himself in the spring and summer as a consensus builder in both chambers – a striking difference from his early years as a Senate rabblerouser. "I continue to believe we can and will get this done," Cruz said Tuesday afternoon. "The path of Obamacare repeal has been bumpy, and this week was no exception." Some Republicans have begun to talk of ditching repeal efforts altogether and working with Democrats on a bipartisan "fix" of the 2010 health care law. U.S. Sen. Lamar Alexander, a Tennessee Republican and chairman of the committee that oversees health care policy, said Wednesday he expected the repeal bill to fail and announced coming hearings "to continue exploring how to stabilize the individual market." Cornyn was dubious of Democratic involvement. In a news conference, he called the "structure of Obamacare a failed experience," and then cautioned of a future without a GOP bill. "We're going to continue down that road because the alternative, I fear, is going to be a Democratic effort strictly to bail out insurance companies with no reform whatsoever," Cornyn said. GOP overhaul efforts have been declared dead before, only to see legislation resurrected. And Democrats faced similar struggles in their successful 2010 push. But such an overt rebellion by both conservative and moderate Republican senators made this time seem different. The recent complaints were personal and pointed toward leadership, with lawmakers howling over the fact that negotiations were secretive, did not involve committee hearings and were dominated by men in the conference. Politically, there are major questions ahead for the GOP. Since 2010, Republican candidates and affiliated groups have spent a combined $666 million on 1.3 million ads attacking "Obamacare," according to the Cook Political Report and Kantar Media/CMAG, a firm that tracks ad spending. "Every Republican in the last seven years has campaigned on repealing Obamacare," Cruz said. He then warned of an erosion of "the credibility of the conference ... if we fail to deliver on that promise." A similar sentiment came from some in the U.S. House Tuesday. U.S. Rep. Jodey Arrington, a Republican from Lubbock, joined 11 other freshmen Republicans in urging the Senate to act. "We House Republican freshmen remain fully aware that we were elected with a mandate from voters to end the pain that Obamacare has caused and provide a better solution," they wrote in an op-ed for foxnews.com. "Failure to do so is a failure to follow the will of our voters who elected a Republican majority to both the House and Senate, placed a Republican in the White House and worked tirelessly to secure change from the status quo." Texas-based Republican political consultant Brendan Steinhauser's early read of the fallout was that the party has reasons to be worried about next year's midterm elections. "I think that you will see that if this fails, Republicans in Congress will get blamed," he said. "I think you will see a very angry base that will attract some primary challengers to these members of Congress from the right, and I think you'll see some of these voters stay home in the midterm [general election]." "I think that is the more dangerous trend for Republicans," he added. "... In general, the consensus is, 'You guys have been making this promise for seven years to repeal Obamacare ... If you guys can't achieve it then why did we send you to Washington?'"